Launched in 2019, Pretty Slots casino is owned and operated by Jumpman Gaming Ltd. The welcome page immediately tries to lure you in with some great prizes from its new player offering. Immediately beneath are some popular video slots, a list of big winners, and some basic information about the operator. The website’s design is dominated by a gorgeous city skyline at night, blending into darkness the further down you scroll. The casino has dual licenses by the UK Gambling Commission and the Alderney Gambling Control Commission. Pretty Slots uses encryption, firewalls and access control policies to protect user information. With a centred screen and big tiles, its mobile first design makes it very easy to use on a touchscreen. It is safe to say the website’s focus is on video slots, given its name and the welcome screen. Gamblers can find some timeless classic slots in the Pretty Slots casino library, or can try some newer games with gorgeous visuals. There is a decent selection of jackpot-based titles available at the casino, too. Furthermore, games from several high quality providers can be found and enjoyed here. Promotions have their own section of the website, and show quite a few goodies for both newcomers and veteran players. ‘Noobs’ get to enjoy the welcome offer and a special cashback bonus. Meanwhile, existing customers get a special VIP scheme, daily cashbacks, free spins, and even a chance to win a pizza or an Amazon voucher. Pretty Slots has a solid number of available games, for a total of 626 different titles. However, it is quite difficult to find what you are after, unless you know exactly what you are looking for. The sorting options are incredibly limited, which means we may have allowed some information to slip through the cracks accidentally. The website gives you lots of slot choices, but few options on finding your dream game. There is no demo version to let gamblers quickly test the title to see if they will enjoy it. Quite a few newer slots can be found at this casino, made by popular providers like NetEnt, Pragmatic Play and Microgaming’s various studios. 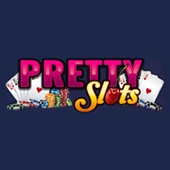 A total of 42 jackpot games can be found under Pretty Slots’ jackpots category. Some of these are exclusive to this section, but most seem to be existing titles with jackpots added. We are not against this idea, but it does artificially inflate the number of available slots on the website. If you hoped to relax with some table games, you will find an incredibly limited offering. There is only one blackjack title available at this operator, and two European roulette games. Fans of baccarat, video poker, or other popular alternatives will not find what they are after here. At the time of writing this review, we found no live casino titles. We assume Pretty Slots will add more over time. But given the laser-focus on video slots, and the anaemic offering of table games, our hopes are not high. For the time being, those yearning for the thrill of besting others at poker will have to skip this operator. Arcade games were also a mixed bag. Bingo had its own special section with five offerings. We also found two lotto titles, but little else in terms of variety. We hope Pretty Slots’ offering will improve over time, and that the lack of non-slot games are just growing pains. The operator allows deposits to be made by Visa, MasterCard and Maestro cards, Paysafe cards, Pay by Mobile and Paypal. It does not give you a lot of options compared to other casinos. As a rule of thumb, the website will also try to send withdrawn money back from the same source it was deposited from. Withdrawal are restricted 48 hours after the player makes their first deposit, or adds a new payment method. £250 is the maximum amount that can be converted from bonus to real money. Any bonus cash above this cap is deleted once the gambler completes the wagering requirements. Pretty Slots verifies the age and identity of all players before any withdrawals can be made. The casino makes gamblers go through a 72 hour pending period after they choose to withdraw their money. All withdrawals can be reversed during this time period, but not afterwards. Once the pending period passes, it can take between 1-3 working days for the funds to appear in your account. All customer balances are kept on separate bank accounts from the casino’s own funds. However, this money is not protected in case that Pretty Slots becomes insolvent. The casino has two licenses. British players follow regulations from the UK Gambling Commission, while gamblers from the rest of the world follow rules set by the Alderney Gambling Control Commission. The UKGC license is in a league of its own, with Alderney not lagging far behind. The operator promises to keep all player data secure using encryption, firewalls and access control policies. Conducted third party security audits find Pretty Slots and its parent company to be compliant with ISO/IEC 27001:2013 standards. Should something go awry, you can reach out and contact the staff using e-mail or live-chat. Support is available on working days between 09:30 up to 18:00. However, there is no phone number gamblers can use to call the casino directly. If you need any question answered, odds are you can find the solution in the FAQ. It covers lots of basic and important information, so we recommend skimming through if you plan to play here. At the time of writing this review, Pretty Slots does not have any social media presence. Like many new casinos, it takes off at a running sprint, and then trips up midway. We do find the background image gorgeous, and slot-lovers will have a good selection to pick and choose from. It also brings strong licenses to the table, as well as a commitment to user security. However, if Pretty Slots casino wants to go from average to great, a few things need fixing first. The addition of new table and live casino games would draw in an extra crowd. After that, a few more tabs or a sidebar that lets players set exactly what they are after would be great. Finally, a few more payment processors could be useful, especially more popular ones. With the backing of the Jumpman Group, we do believe this operator could be fantastic if it fixes its problems. None are particularly demanding except for the sidebar, but the improvement to the user experience would be worth the effort. Only then, can be said that Pretty Slots is pretty good.